If you wish to use this font commercially "as downloaded," a PayPal donation not to exceed $5 US is always appreciated. Use the Donate button on this page for your convenience. Everyone remembers their first. 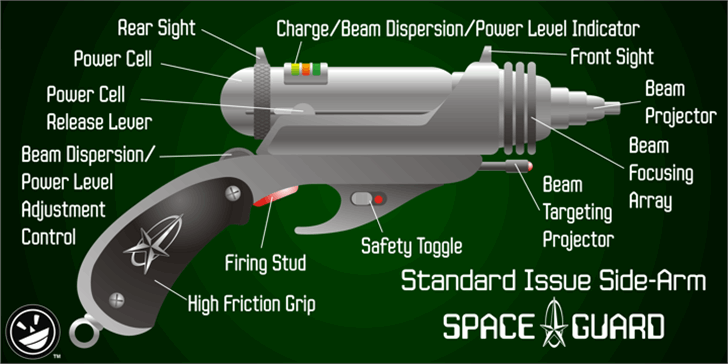 JLS Space was my first. It was the first computer format font that I created. 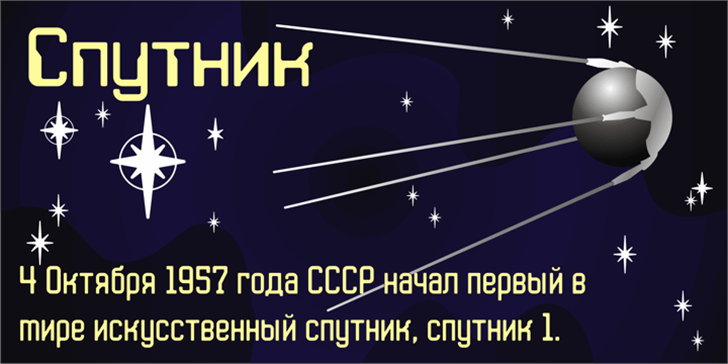 The font was inspired by the sci-fi movie posters, book covers and comic books of my childhood. Its crude letterforms were conjured in an all night marathon session with no sketches and no planning. A simple character set, it consisted of upper case, lower case, numbers and basic punctuation. But, the project was little more than an interesting exercise, and JLS Space faded into digital limbo. This unfortunate font was ignored and lost for fifteen years. Mike Adkins, my co-conspirator, found and rescued the font file from the depths of a failing hard drive. He sent the file to me as a curiosity - a glimpse back at our humble beginnings. I started puttering around with it on a whim. Without really trying, Data Gothic began to form. The interesting letter forms in Data and Space Gothic struck a cord, and I was inspired to complete the project almost twenty years after it was started. 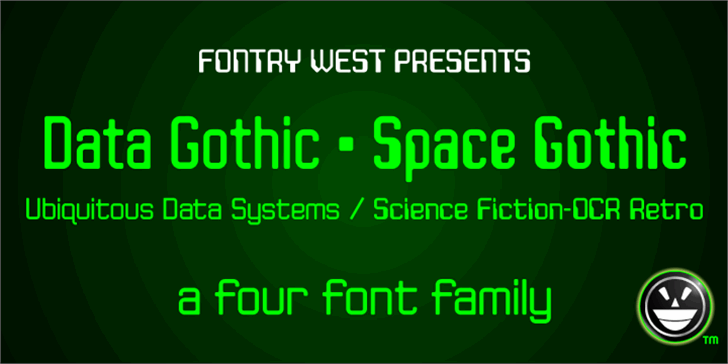 JLS Space Gothic was inspired by the OCR and MICR fonts of the science fiction genre. 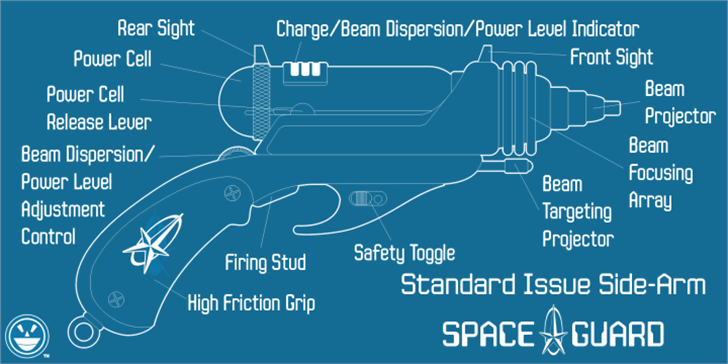 Today, its character will enhance terms like Computer Diagnostic or Space Age Polymer. Posters, titles and displays will boldly blast off into the market place with these cybernetic letterforms. 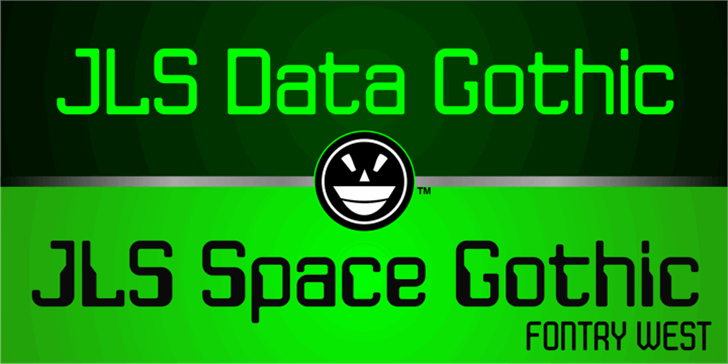 If Space Gothic is retro and seems limited in its genre, Data Gothic is contemporary with a broad spectrum of uses. This futuristic gothic doesn't sacrifice legibility for style. 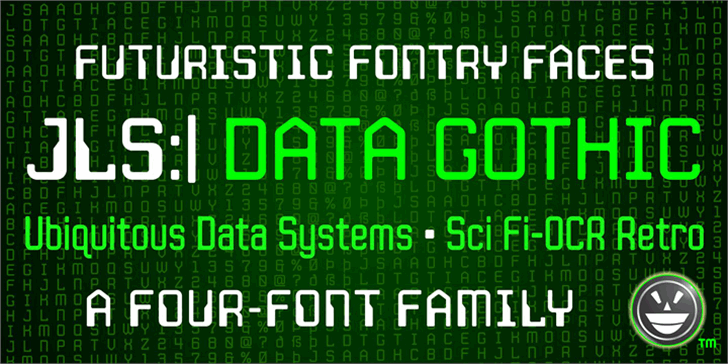 As a screen font, JLS Data Gothic is excellent for technical specifications, on screen dialogue, labeling, etc. In print, Data Gothic is a great font for text in manuals, schematics, maps and diagrams. Copyright (c) 2012 by James Stirling and the Fontry. All rights reserved. JLS Data Gothic-C is a trademark of James Stirling and the Fontry. JLS Data Gothic-R is a trademark of James Stirling and the Fontry. JLS Space Gothic-C is a trademark of James Stirling and the Fontry. JLS Space Gothic-R is a trademark of James Stirling and the Fontry.